August babies, you are in luck: you have a brand-new birthstone! In June, the Jewelers of America and the American Gem Trade Association announced that August would now have two birthstones: the traditional peridot and the spinel. Spinels come in a variety of colors, but the most famous hue of all is red. These red spinels were long known as "balas rubies," and in fact, for centuries, spinels were regularly mistaken for rubies. The technology to distinguish between the two stones wasn't available until the 1700s. 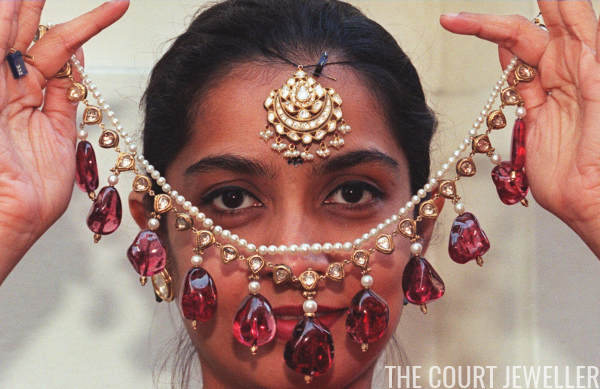 Because of this, many of the great "rubies" in royal collections from centuries past were actually spinels. Today, we're looking at four of these great red stones, which are part of crown jewel collections from the UK to Iran and places in between. Perhaps the most famous spinel in the world is the one set in the Imperial State Crown. It's called the Black Prince's Ruby, even though it's not a ruby at all -- but, as I noted above, no one could tell the different between spinels and rubies until the eighteenth century. And this spinel's story is much longer than that: history finds it likely first in the hands of a prince from the Kingdom of Granada in the fourteenth century. He lost the stone (and his life) to Don Pedro, ruler of the Kingdom of Castile, who later gave the spinel to Edward of Woodstock in exchange for an alliance that helped secure his throne. Edward of Woodstock is better known by his historical nickname, the Black Prince. He was the son and heir of King Edward III of England, but he was also a skilled soldier, and he spent much of his time waging military campaigns in France and Spain. Fittingly, the "ruby" that bears his name is also often said to have been worn by English kings at two major battles: the Battle of Agincourt (where it was worn by the victorious Henry V) and the Battle of Bosworth Field (where it was worn by the unfortunate Richard III). Today, the spinel is set in the front cross of the Imperial State Crown, which is worn by the monarch regularly at the state opening of Parliament. At one point, the spinel was drilled so it could be worn as a pendant; today, a small cabochon ruby plugs the hole. The Brits also have another spinel in their collection: the Timur Ruby, which is called a ruby because, well, everyone thought it was one until 1851. The spinel's name comes from Timur (also known to the Western world as Tamerlane), founder of an imperial dynasty in Asia. The names of several of the stone's Indian owners are inscribed directly on its surface. Some of these owners, including the Mughal emperor Jahangir and Nadir Shah, king of Persia, also owned the Samarian Spinel (see below). This spinel arrived in British hands in 1849, when the British East India Company acquired it (along with the Koh-i-Noor Diamond) from Duleep Singh. (For more on this controversial transaction, head over here.) In turn, they presented it to Queen Victoria, who had it set in a necklace. Even so, it's one of the many theoretically-wearable pieces from the Royal Collection that isn't worn, most likely out of sensitivity to its political history. The Black Prince's Ruby may be the most famous spinel in the world, but the Samarian Spinel from the Iranian crown jewel collection is almost certainly the largest, weighing 500 carats. Like many of the great treasures from Iran's crown jewels, the spinel was captured from India by a Persian king, Nadir Shah (1698-1747). It's likely that the spinel was owned at one point by Jahangir, the fourth Mughal emperor, who reigned from 1605 to 1627. Today, the spinel resides in Tehran's Central Bank, along with the rest of the nation's crown jewels. 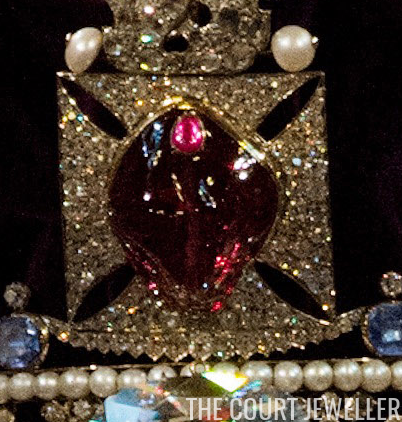 Like the Black Prince's Ruby, the Samarian Spinel has a hole drilled into it, most likely so that it could be worn as a pendant. In the past, that hole was filled by a diamond, but that diamond has since been removed. The French crown jewel collection has been fractured over and over again throughout the nation's topsy-turvy political history, but one of the oldest parts of the collection -- the Cote-de-Bretagne Spinel -- still resides in Paris today. The stone gets its name from one of its first recorded owners: Marguerite of Foix, Duchess of Brittany. Marguerite's daughter, Anne (1477-1514), was the Duchess of Brittany in her own right, as well as the wife of a Holy Roman Emperor (Maximilian I) and two French kings (Charles VIII and Louis XII). The spinel eventually ended up in the hands of Anne's grandson, King Henri II, who reigned from 1547 to 1559. Later, the stone underwent a radical transformation; during the reign of Louis XV, it was carved into the shape of a dragon and mounted in his crown. Following the revolution, however, the spinel was stolen (along with the majority of the crown jewels). It eventually found its way back to Paris, where it's now on display at the Louvre.